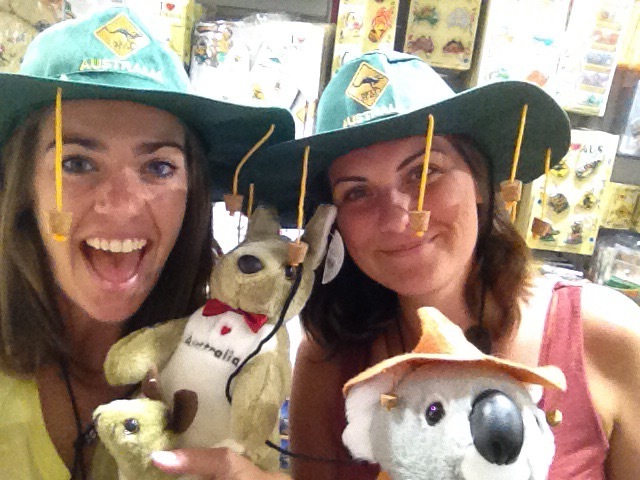 No sickness can keep me from embracing UK stereotypes of Australians! “I think the Gators made me sick,” I told my new friend. “Sorry – who are the Gators?” Ugh. Sometimes it’s difficult living abroad. For one, your new friends are not usually the kind of friends you can share the typical banter from home. These new friends also come with a new set of international germs and with that, the possibility of becoming ill. I have lived in Sydney for a month now and have been sick twice within that month. Illness is another difficulty while living abroad. Without your typical routines, eating habits, germs, and doctors around, it can be challenging to know what to do when sickness strikes. My first bout happened while living in Bondi Beach. I developed a head cold that forced me to spend more time resting than I would have preferred. I had recently moved to a AirBnB apartment, my third place of residence in two weeks, and the weather had dramatically shifted from rainy and 60 degrees to sunny and 90. Was it the change in weather? A new allergy development? The questionable cleanliness of my new living arrangements? Perhaps all of these conditions contributed to my inconvenient sniffles, deep cough, and overall fatigue. I popped into a pharmacy, hoping to find Emergen-C or its equivalent, and spoke with a pharmacist about my symptoms. She suggested a pill filled with vitamins and oils to help fight off the development of a cold or at least shorten the length of a current one. I took her advice, purchased the pills, and continued my personal remedy of water, fruit, and extra sleep to fight this one. A week later, I was feeling better, with only the typical lingering cough as a reminder of my recent illness. I would not be as lucky with the next one. I’m no doctor, but I would dare to announce a simple fact – traveling breaks down your immune system before building it up. Living in multiple hostels and apartments over the past month, I have been exposed to more germs than ever before. Sure, working in education has forced my immune system to beef up but that is nothing compared to the new germs I’ve been exposed to since traveling abroad. Combined with a less healthy diet, falling out of my exercise routine, an increase in drinking, and less sleep than usual, and I set myself up for a major shock to my immune system. And this time I developed a sickness that knocked me down for three full days. I recently began working at a popular cafe and roaster in the city and was working my first weekend shift when it happened. It was a Sunday morning and I had awoke feeling nauseous. Knowing how crazy weekends can be at my new job, with epics waits for a table which run over an hour and a half, I couldn’t call in sick. I decided to give it a try, to see how it goes. Unfortunately, I wasn’t far into my shift before I learned how the day would end. Apologizing to my new co-workers, I took off for the bathroom, awaiting the violent eruption from my stomach. It didn’t come. As I shuffled back to the front door, I warned my manager of how I was feeling. Not wanting to lose me, she suggested I take a short break, some time to drink water and sit down. The break did not help much though as, 30 minutes later while taking names for our wait list, I felt the threat again. I knew I could not hold off and, beyond that, I could not stand there writing and smiling any longer. Moving much faster this time, I made it to the restroom just before vomiting into the toilet. ‘Where did this come from?’ My mind raced. I can’t even remember the last time I was actually sick like this. Karma, perhaps, for all the times I’ve claimed food poisoning when calling out of work? Regardless, I was done. Heading home from work, I messaged a new friend of mine detailing my plight. We were moving hostels that day and I had already checked out of my room earlier that morning. Now I was sick and homeless. Knowing it was too early to check in to the new place, I laid down on the lounge couches to wait. Thankfully my room was ready earlier than the 1pm check-in and I was able to sleep most of the day. Around 5pm my friend and I trekked the two blocks back to the previous hostel to collect my belongings which I had left in storage for the day. Although it was a short walk, I was weak and exhausted, needing a break after grabbing my bags. My friend and I sat on the couches once again as I drank water from my Florida Gators water bottle in anticipation of the short walk back. Unfortunately, the walk became epically long when, just a few feet down the road, I urgently darted over to a trash can at the street corner, desperately in need of a place to vomit. Throwing up in public is another new experience for me, one that I’m grateful included a trash can rather than simply a concrete sidewalk. It was a full three day and another visit to my local pharmacist before I felt back to myself. I increased my fiber intake with extra fruit, vegetables, and whole grains, as well as purchased a probiotic at the recommendation of the pharmacist. During my three days of recovery, I spent a lot of time sleeping, listening to a Harry Potter audio book, and considering the culprit of this most recent illness. And so I return to my original declaration, ‘the Gators made me sick’. A new acquisition, my Florida Gators water bottle has been a valuable addition to my backpacking adventure. Not only has it saved me money but it has also helped me remember the importance of frequently drinking water. However, I was not as good to the bottle as it had been to me and conveniently forgot to clean it between regular refills. Thinking back on my sick Sunday and the timing of my water bottle gulps with my reactive stomach, it seems there was a correlation between the two. I can’t say with complete certainty that it was my dirty way bottle that made me sick, but I’m confident that it didn’t help. Another lesson learned and a not-so-gentle reminder to get back to my healthy eating and exercising habits. Sorry to hear about this horrible experience. Glad you’re feeling better.